Peaches Geldof has been found dead. The 25-year-old mother-of-two, the second eldest daughter of musician Sir Bob Geldof and Paula Yates, passed away this afternoon (07.04.14). Police were called to an address near Wrotham, Kent after someone expressed concern for the welfare of a young woman. The model was later pronounced dead by South East Coast Ambulance Service. Peaches has two sons, Astala, who is set to turn two on April 21, and Phaedra, whose first birthday will be on April 24, with her husband Thomas Cohen. The blonde beauty married the lead singer of the South East London band S.C.U.M on 8 September 2012 at a church in Davington, where her mother's funeral took place almost 14 years ago. Peaches' mother Paula died of a drug overdose in September 2000 when she was just 11 and during an interview with Elle magazine in 2012, she admitted she was still coming to terms with the loss. She said: ''I remember the day my mother died, and it's still hard to talk about it. I just blocked it out. I went to school the next day because my father's mentality was 'keep calm and carry on','' she said. She was previously married to rock musician Max Drummey but they separated in 2009 after a six-months. Sir Bob Geldof has paid tribute to his daughter Peaches Geldof, who died on Monday afternoon (07.04.14) at the age of 25. Sir Bob Geldof has paid tribute to his daughter Peaches Geldof, who died suddenly on Monday afternoon (07.04.14). The body of the 25-year-old model, TV personality and DJ, who has two young sons, Astala and Phaedra, with her husband Tom Cohen, was found at her home in Wrotham in Kent, England, and investigators have yet to determine a cause of death. In a statement, the 62-year-old Irish musician said: ''Peaches has died. We are beyond pain. She was the wildest, funniest, cleverest, wittiest and the most bonkers of all of us. Writing 'was' destroys me afresh. What a beautiful child. ''How is this possible that we will not see her again? How is that bearable? We loved her and will cherish her forever. Police were called to the couple's house at 1.35pm after receiving a report of concern for the welfare of a woman. Shortly afterwards Peaches was pronounced dead by South East Coast Ambulance Service. Lily Allen has led tributes to Peaches Geldof, following her sudden and unexplained death on Monday afternoon (07.04.14). The TV personality and DJ, 25, who has sons, Astala, 23 months, and Phaedra, 11 months, with husband Tom Cohen, was found dead at their family home in Kent, England on Monday afternoon (07.04.14). Sharon Osbourne is ''devastated'' following Peaches Geldof's ''unexplained and sudden'' death. The 25-year-old model and columnist - who has two sons, Astala, 23-months, and Phaedra, 11-months, with husband Tom Cohen - passed away at her home in Kent, England on Monday afternoon (07.04.14). TV presenter Paula died of a heroin overdose in September 2000, after splitting with Bob and forming a relationship with INXS frontman Michael Hutchence, who died in 1997. Peaches, who previously admitted drug use as a teenager but said in 2009 that she was ''sober now,'' is also survived by older sister Fifi Geldof, 31, and younger half-sister Tiger Lily Hutchence Geldof, 17. A post-mortem is expected to take place in the next few days. Peaches Geldof's friends insist she wasn't on drugs before her ''unexplained and sudden death'' on Monday (07.04.14) and was devoted to her young family. Peaches Geldof's friends insist she wasn't on drugs before her ''unexplained and sudden'' death. The 25-year-old star's body was found at her five-bedroom home in Kent, England at 1.35pm on Monday (07.04.14), and while pals admit she was ''fixated'' on her late mother Paula Yates' death from an accidental drug overdose in 2000, she was devoted to her husband Tom Cohen and sons, Astala, 23 months, and Phaedra, 11 months. The friend added: ''The reason she was so thin is because she had an underactive thyroid and when she got pregnant, that went mental. Police officers found no evidence of hard drugs or a suicide note at the model and DJ's home, and there were no visible signs of injury. But another insider said: ''She had her mother's temperament. It's like she had a daughter/mother death wish. An ambulance was spotted arriving at her home at 8.30pm on Monday night and forensic experts left the property 30 minutes later. 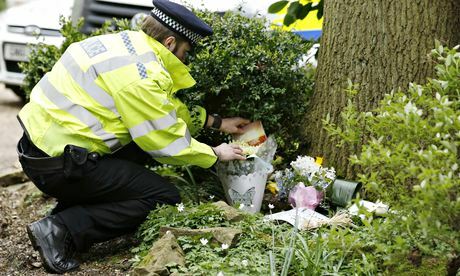 A post-mortem is expected to take place later on Tuesday (08.04.14). Police didn't find a suicide note or a the hard drugs at the home of Peaches Geldof, who was found dead in her home in Kent, South East England, yesterday (07.04.14). Peaches Geldof did not leave a suicide note at her home where her body was found. The young star - who has two young sons, Astala and Phaedra, with her husband Tom Cohen - tragically passed away at her home in Kent, South East England, yesterday (07.04.14) at the age of 25 and her death is being treated as ''unexplained''. Police claim she didn't leave a suicide note, they also insist there has been no evidence supporting the use of hard drugs. A post-mortem examination on Peaches will be carried out on Wednesday (09.04.14) at a Kent hospital by a Home Office pathologist Dr Peter Graham Jerreat and the need for an inquest will be down to the results of this. Earlier today, Fifi Geldof paid tribute to her late sister and shared her heartbreak over the death of the young star. Fifi and Peaches are the daughters of Boomtown Rats legend Bob and late TV presenter Paula Yates. They have a younger sister, Pixie, 23, and a half-sister, Tiger Lily, who is Paula's daughter with deceased INXS frontman Michael Hutchence. Bob who is mourning the loss of Peaches claims the ''wittiest and the most bonkers'' of his children has been taken from the world. Tributes to Peaches Geldof continued to pour in, on Tuesday, for the 25-year old who died at her Kent home the day before. Detectives from Kent police carried out investigations at the house at Fairseat Lane, Wrotham, where the journalist and model was pronounced dead. They declined to confirm or deny reports that no drugs or suicide note were found at the home. "Officers are working to establish the circumstances and will be compiling a report of their findings for the coroner," a police spokesman said. They were treating Geldof's sudden death as unexplained but non-suspicious. It emerged on Tuesday that Geldof had recently written of her sense of "bliss" about her family life. "I'm happier than ever," she wrote in a magazine column published on Tuesday, describing how she had put "a life of wanton wanderlist" behind her. "When I had two wailing, smiling, joyful little blobs of waddling pink flesh they became my entire existence and saved me," she wrote in Mother and Baby magazine. Her sister Fifi Trixibelle Geldof, 31, spoke out about the shock death in an online message which read: "My beautiful baby sister … Gone but never forgotten. I love you, Peaches x." The note was posted alongside a picture of the two sisters pulling faces in a garden when they were young girls. Her father, Bob Geldof, said he was "destroyed" by his daughter's death. He was understood to be coming back from a speaking engagement in San Fransisco. Fans and well-wishers dropped off bouquets of flowers at the gates of the large family home as more famous supporters of the Geldof family sent messages of condolences. They included the singer Sinead O'Connor and Ireland's president, Michael D Higgins, who is in the UK on a state visit. Higgins had been due to meet Bob Geldof, and said: "This is such a difficult cross to bear for any family and all of our thoughts are with Peaches' family and friends at this time." Peter Graham Jerreat will carry out the post mortem at Darent Valley Hospital, in Dartford. A decision on whether there will be an inquest will depend upon the final results of the examination which could take several weeks, Kent county council said. The result of the initial post mortem is expected to be known today. Kimmy Milham, 30, from Maidstone, was one of those delivering flowers to the house. She said she did not know Geldof personally, but had a friend whose children attended the same nursery as Geldof's boys, Astala, who is almost two, and 11-month-old Phaedra. "She was a wonderful person and a wonderful mother," she said. "It's just tragic that her two sons will not grow up with her. Everybody at the nursery loved her and we all admired the way she brought up her kids." In her last interview, published in Mother and Baby magazine, Geldof talked of her "really unstable upbringing". Her mother, the television presenter Paula Yates, died from an accidental heroin overdose in 2000 when she was 11. Two years earlier, the Australian rock singer Michael Hutchence, who was Yates' partner following her split from Bob Geldof, had taken his life in Sydney. In the weeks before she died Peaches Geldof had posted a sequence of pictures and short videos of her children on her Instagram web page and recently said she had left "wild child" tendencies behind to embrace motherhood with her husband, the musician Thomas Cohen. "Since I've had the boys I don't think of the world as a negative place any more," she told Mother and Baby. "I just have so much love. And, through my love for them, I've been reborn into a better, more understanding, more patient person – I feel like an adult." She also told of how tough she found parenting and said: "There's been times I've cried with exhaustion, when they're both screaming, and I've just had to sit down, breathe and be like, 'this is hard'." The magazine's editor, Claire Irvin, who first employed her at Elle Girl magazine when she was 14, said in the interview that Peaches was thinner than before. In 2011, before Geldof became a mother, health experts had voiced concern about her dieting. She had claimed she could lose as much as 10lb (4.5kg) in four weeks by living off nothing but juiced vegetables. She told OK! magazine: "I do juicing. You juice vegetables and then you drink it three times a day. It's gross. I do it usually for about a month." That triggered a response from Cath Collins, spokeswoman for the British Dietetic Association, who warned that such a diet could cause acute cardiac arrest. Her former publicist Ray Levine said he was "beyond saddened" by the news of her death. "She was always entertaining. Very, very, headstrong which made her quite difficult to look after because she wouldn't follow advice," he told the Sun. "She seemed to be heading off track but managed to pull herself back. Peaches lived with a deep sadness from childhood." After days of complete shock and speculation in the wake of the 25-year-old’s death, a post-mortem examination is scheduled to take place on April 9. Soon questions may finally be answered, and the grieving Geldof family may finally know what caused this sudden tragedy. Though Peaches Geldof was found dead at the young age of 25 on April 7, police stated that her death was being treated as “non-suspicious but unexplained and sudden.” Two days later, an explanation may finally be given. A post-mortem examination (otherwise known as an autopsy) will be conducted on the former journalist/model and mother of two, and will likely reveal what cause Peaches tragic death..
Peaches Geldof Post-Mortem: What Caused Her Death? If an inquest — an official investigation to find the cause of death — is opened, it will be held at North Kent Coroners’ Office in Gravesend, England. The post-mortem results are much anticipated, as people — especially Peaches’ father Bob Geldof and the rest of her family — struggle to understand how such a terrible thing has happened. After Peaches’ death, police reportedly found no hard drug and suicide note, and were exploring the possibility that she died of natural causes, according to Mail online. So sad. Three days after Peaches Geldof was found dead at the age of 25 on April 6, a post-mortem examination was not able to conclusively reveal what caused the English model and TV presenter’s tragic death. Peaches Geldof‘s shocking death is unfortunately still a mystery, as the autopsy conducted on April 9 was not able to conclusively determine a cause of death, according to TMZ. Further investigations will have to be made, and a toxicology report, which will take several weeks to process, may be necessary to reveal how the journalist/model died. As Peaches’ family, friends and fans continue to mourn their loss, her autopsy results were released on April 9. Shockingly though, the coroner was not able to make a solid determination. A day before the post-mortem examination, a Kent County Council spokesman said that if necessary, an inquest would be carried out. That seems to be a guarantee now that the autopsy has been deemed inconclusive. Peaches’ body will now be transferred to the North Kent Coroner’s Office, where the presumed inquest will be performed. Peaches Geldof's body has been released to her family to allow for funeral arrangements to be made following her tragic death earlier this week. Peaches Geldof's body has been released to her family. The remains of the 25-year-old TV personality, who was found dead at her home in Kent, South East England, on Monday (07.04.14), have been released to her loved-ones to allow for funeral arrangements to commence. Peaches is expected to be laid to rest at the country church of St Mary Magdalene in Kent, South East England, where her late mother Paula Yates was buried in 2000. The blonde beauty - who leaves behind her husband Thomas Cohen and their sons Astala, 23 months, and Phaedra, 11 months - was also married and christened at the church. A post-mortem carried out yesterday (09.04.14) proved to be ''inconclusive'' and her family - including sisters Fifi, 31, Pixie, 23, and Tiger-Lily, 17 - will now have an agonising wait for a toxicology report, which could take up to several weeks. Police have so far described her tragic death as ''sudden and unexplained'', but non-suspicious as there were no drugs or a suicide note found at her home. A decision on whether an inquest should be held will depend on the results of the examination. Peaches Geldof's son Phaedra, 11 months, was with her when she died, but her husband Thomas Cohen and their eldest child Astala, 23 months, were away. Peaches Geldof's youngest son was with her when she died. The 25-year-old star's husband Thomas Cohen - who had spent a night away with eldest child Astala, 23 months - asked a friend to check on her at their home in Wrotham, Kent, South East England, when his wife failed to answer her phone on Monday (07.04.14), and her body was found with 11-month-old Phaedra playing nearby. Peaches was an advocate of attachment parenting, meaning she was rarely without her young son by her side, and insiders hope her family will take ''comfort'' from the fact she didn't die alone. When Peaches' own mother Paula Yates was found dead at her London home in 2000, her baby daughter Tiger Lily, now 17, was found playing near her mum's body. Yesterday (10.04.14), the presenter's father Bob Geldof was seen visiting her home, where he was greeted by Tom's parents Keith and Susan. The two men spent 20 minutes talking in the garden before the rocker entered the house, leaving two hours later with some of his daughter's belongings. Peaches' body has now been released by coroners so plans for her funeral can be made. Her cause of death remains unexplained. Peaches Geldof's former nanny Anita Debney has paid tribute to her ''brave beautiful girl''. The late 25-year-old star's ex-childminder, who was employed by Bob Geldof and Paula Yates when Peaches was a toddler, has spoken for the first time since the TV personality was found dead at her family home in Wrotham, Kent, South East England on Monday (07.04.14). Anita wrote on Instagram: ''She has been the greatest joy, the greatest blessing, the most tender part of my heart and soul. I loved her through the good times and the bad. We struggled and survived the darkest of times. Peaches - who had children Astala, 23 months, and 11-month-old Phaedra with her husband Thomas Cohen - remained close friends with Anita, visiting her just two weeks ago. The nanny, who is godmother to Phaedra, shared a special bond with Peaches' children and flew back from the US on Tuesday (08.04.14) upon hearing the tragic news and is now expected to play a part in their upbringing. She added in her moving online tribute: ''The joy we shared in her beautiful babies was so deep and meaningful and filled both of our hearts with love and devotion. ''She blossomed in motherhood and excelled at raising the sweetest, happiest babies in the world. She was passionate in her zeal to speak up for the needs of babies everywhere and lives have been changed because of that. Peaches Geldof's ashes are to be scattered alongside her mother Paula Yates' in the grounds of Davington Priory, Kent because the area held many happy memories for the family. Peaches Geldof's ashes will be scattered alongside her mother's. The late 25-year-old star will be laid to rest in the grounds of the gardens of Davington Priory, Kent - where her childhood home stood - as it held a special place in her heart following Paula Yates' own funeral at the nearby St. Mary Magdalene church. The decision was reportedly made after discussions between her husband Thomas Cohen, father Sir Bob Geldof and sisters Fifa, 31, Pixie, 24 and 17-year-old Tiger. Peaches' old nanny Anita Debney was also involved in the talks, and she recently paid tribute to the late star on Instagram. She wrote: ''She has been the greatest joy, the greatest blessing, the most tender part of my heart and soul. I loved her through the good times and the bad. We struggled and survived the darkest of times. Peaches Geldof will be laid to rest on Easter Monday (21.04.14) at the same church her late mother Paula Yates was buried in 2000. Peaches Geldof's funeral will take place on Easter Monday (21.04.14). The body of the 25-year-old star will be laid to rest at the country church of St Mary Magdalene in Davington, Kent, South East England, where her late mother Paula Yates was buried in 2000. Peaches' father Sir Bob Geldof, 62, will give a eulogy at the service, which will be invite-only - similar to Paula's ceremony 14 years ago - for friends and family. An insider told The Sun newspaper: ''Bob is keen to speak as he did at the funeral of Paula and his dad Bob Snr in Dublin, but he knows it won't be easy. Peaches' body, which was released to her family by the coroner last Thursday (10.04.14), will be taken to the church - where the star was also christened and married in 2012 - ahead of the heartbreaking mass next week. It is believed her body will be cremated and her ashes will be scattered alongside her mother's at her family home, the gardens of Davington Priory, Kent, where she grew up. Peaches was found dead at the home she shared with husband Thomas Cohen and their sons Astala, 23 months, and Phaedra, 11 months, in Wrotham, Kent, on April 7 after Thomas raised the alarm when she failed to answer his calls. Peaches' devastated family, including sisters Fifi, 31, Pixie, 23, and half-sister Tiger, 17, are now awaiting the results of toxicology tests, which could take weeks, after an inconclusive post-mortem last week. Peaches Geldof's funeral took place at St Mary Magdalene church in Davington, Kent, England today (04.21.14). Kate Moss and her husband Jamie Hince, Trudie Styler, Sarah Ferguson, Jools Holland, Nick Grimshaw, Jo Wood, TV presenter Alexa Chung, Razorlight frontman Johnny Borrell, singer Eliza Doolittle, actress Jaime Winstone and Rolling Stones bassist Bill Wyman were among the mourners to pay their last respects to the 25-year-old star, who was found dead at her home in Wrotham, Kent exactly two weeks ago on April 7. Peaches' father Sir Bob Geldof gave an emotional eulogy during the private service and her younger sister Pixie Geldof, 23, also spoke in the church, where Peaches' married Thomas Cohen two years ago. Her sisters Fifi, 31, and Tiger-Lily, 17, also attended the funeral. A hearse carrying her sky blue coffin, adorned with a painted picture of the blonde beauty, her husband, their sons Phaedra, 11 months, and Astala, 23 months, and their dogs, arrived in the area shortly before 1pm GMT. Peaches' ashes are expected to be scattered in the garden of Sir Bob's Davington Priory country estate, where the former model grew up. The streets were lined with well-wishers as mourners arrived for the service. Peaches' death is being treated as "non-suspicious", but an autopsy proved to be inconclusive earlier this month. The star's family now have an agonizing wait while toxicology tests are carried out.